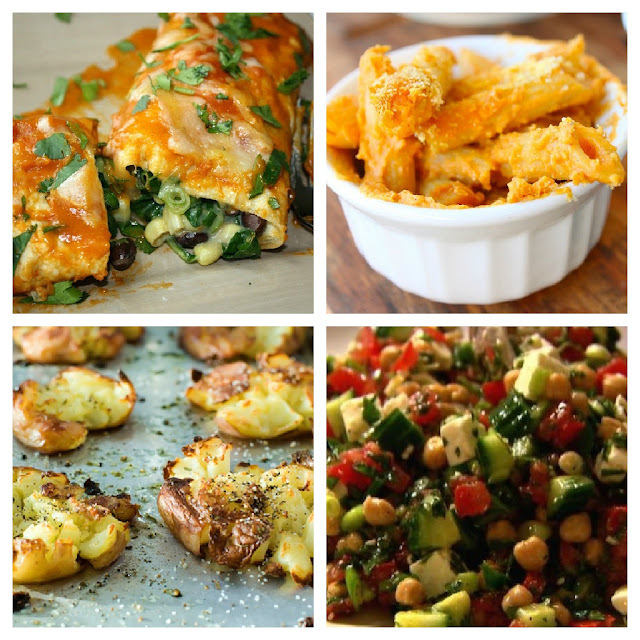 Just a few recipes to whet your appetite and get your hungry on! These Potatoes are truly amazing. We've made them 3 times in the past 2 weeks. Very very yummy. Boiled red skin potatoes, mashed, seasoned and baked on a high heat til crispy=melt in my mouth! Mike's aunt made a salad very much like this one for a recent lunch and I wanted more of it! SO good. The Enchiladas are very tasty and a nice switch-a-roo from the normal refried bean and cheese ones. Rebecca gobbles them up every time. The mac n goat cheese is a fun change from your regular run of the mill macaroni. Rebecca and Hannah are allergic to dairy, but they can both do goat's milk. Costco runs an excellent price on goat's cheese and so I tried this recipe out. We were not dissapointed. Enjoy! It's always fun to see inspiring pictures to help get the creative juices flowing.